The best gaming mouse list is bound to garner the interest of PC players looking for an apt addition to their set of peripherals. When it comes to the finest selection as far as the accessory is concerned, you simply know that the array is going to be incomplete without the mention of renowned companies such as Razer, Logitech, Mad Catz, SteelSeries and more. Scurrying across this virtual mouse mat are some excellent picks that would surely have ardent gamers vying to get their itchy fingers on one of them. So without further ado, we present our engaging roster of gaming mice. 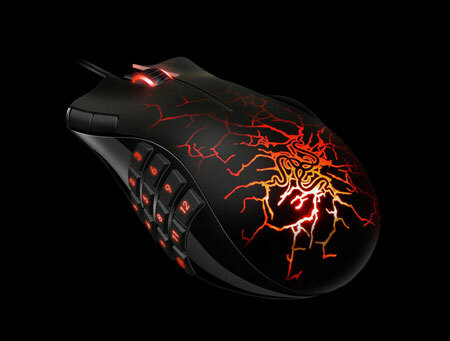 We begin this device-drenched list with the likes of the Razer Naga MMOG – Molten Edition. Clocking in at the Expert level as per company standards, the familiar Naga is doused with a new appearance that portrays a design inspired by its fiery namesake, of course. Besides just aiming to sit pretty besides your PC, it also seems to be a formidable weapon against evil doers while taking on interesting MMO games. It is littered with custom interface add-ons as well as a multi-button thumb grid. 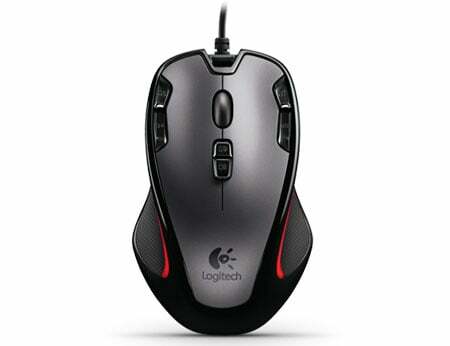 The mouse comprises of 17 knobs, which allow you to seamlessly remap and assign macros to each of them. In addition, you can also take advantage of unlimited character profiles with add-ons and zero-acoustic Ultraslick feet, for an untamed gaming experience. 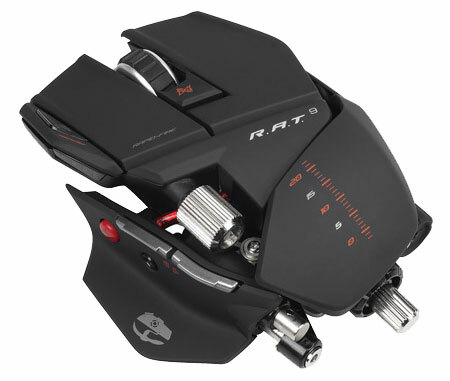 Other attributes include a 5600dpi Razer Precision 3.5G laser sensor and 1000Hz Ultrapolling/1ms response time. With a host of features packed into its humble shell, the SteelSeries Sensei forays onto our gaming mouse roster. According to the company, the device is powered by a powerful 32-bit ARM processor, which enables it to attain up to 11,400 DCPI, as well as the SteelSeries Engine software. Further exploiting its simplicity, users can take advantage of its plug-and-play attribute, without having to install any software of sorts. 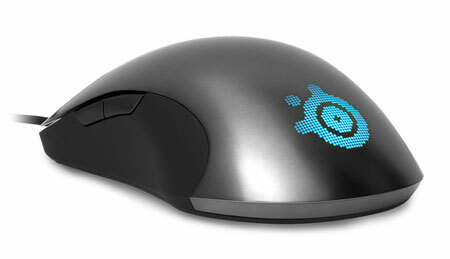 An LCD display located on the backside of the mouse allows players to tweak the integrated driver without any hassles. Playing in the dark with this customizable peripheral seems to be another experience altogether, as you can individually drench the wheel, SteelSeries logo and CPI indicator in 16.8 million different hues. 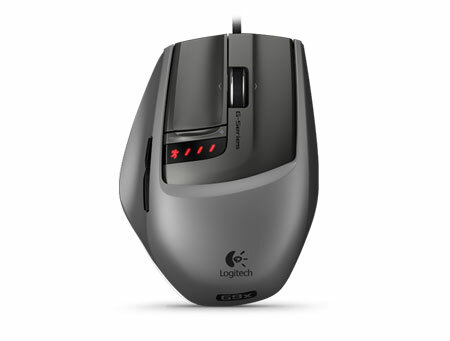 ‘Tune your mouse for the way you play’ is the tagline Logitech employs to draw attention to the G9x. There are two options provided for gamers – Wide Load grip and Precision grip. While the former enables extra comfort, the latter is an apt choice for smooth fingertip control. Besides just touching on the comfort aspect, it is also a mean machine in terms of tracking resolution, which clocks in at 200 – 5700dpi and a maximum acceleration of 30G. 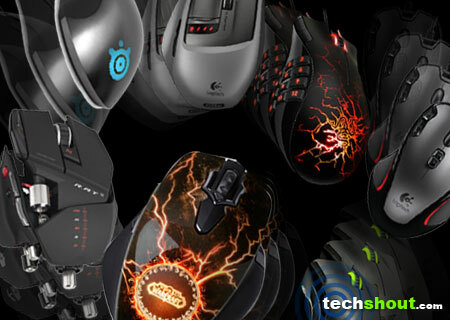 You can also put on your game face while playing on any other PC as the mouse lets you program up to five profiles. This covers dpi settings, keyboard macros and LED colors. The precise click-to-click and frictionless scrolling options are perfect for weapon selection and surfing through web pages, respectively. Who does the next entrant into our gaming mouse array remind you of? Is it the fearless Terminator or maybe General Grievous of Star Wars fame? Well, whoever may be your pick, the Cyborg R.A.T. 9 indeed dons a futuristic appearance with enticing attributes to match. Giving the wire a miss, this offering is infused with zero latency 2.4GHz wireless technology for acquiring a 1ms response time to keep you quick on your virtual feet. It comes complete with a wireless receiver or recharge dock as well as two custom built lithium-ion battery cells. Furthermore, there are interchangeable pinkie grips and palm rests for that desired comfort level while indulging in your favorite PC games. Boasting of 5600dpi, it enters with four custom dpi settings, which can be accessed via the Rocker Switch. 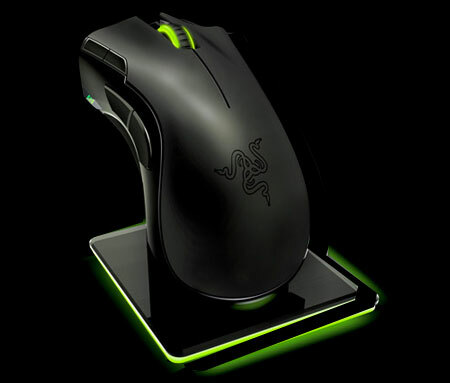 Razer makes a comeback in our list, this time jumping in with the Mamba 2012 Edition. The latest version adopts a 6400dpi 4G dual sensor system that exploits the optical sensor and the laser for taking the tracking precision to new heights. As the company reveals, up to 15% improvement in the battery life is observed as well as a new multicolored LED for ultimate personalization. Like the Cyborg R.A.T. 9, this entry too, employs a wireless look and is accompanied by a sleek charging dock to pour life into the unit when low on juice. Slapped with the Razer’s Elite tag, it features 1000Hz Ultrapolling/1ms response time, while tipping the scales at just 136g. With the inclusion of the SteelSeries World of Warcraft MMO – Legendary Edition, the hot, flaming motif complete with cool cracks seems to be the order of the day. 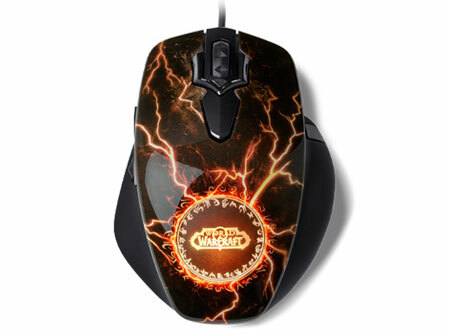 This gadget sports a lightning bolt design accompanied by the World of Warcraft logo etched right in the middle of the device. The hues peering through the fissures can be personalized with 16.8 million color options at your disposal and four levels of pulsation. Drag and drop software settings are available for more than 130 preset game commands, while 11 user-friendly, programmable buttons are scattered across the mouse for easy access. The PC and Mac compatible peripheral in our gaming mouse list incorporates an optical sensor with 30G acceleration and a lift distance of 2mm. Seeming to garner significant acclaim from the PC player community, the Logitech G300 claims to provide nine programmable controls along with a trio of onboard profile options. The second product from the company’s stable to feature in our roster, is crafted by employing a sculpted ambidextrous form factor and easily accessible controls, which render users with a comfortable gaming experience. Touted to keep you in command at all times, it further proffers a 2500dpi optical sensor, durable buttons and a quick report rate. As customizable as it gets, you can assign one of the seven shades to each profile, for seamlessly distinguishing between them. Last but not the least, the modestly-priced mouse utilizes easy custom configuration for each game. So with the last delightful entry, we conclude our best gaming mouse search. Which one of the aforementioned options has already managed to team up with your PC and keyboard? And if you think any of your favorite non-furry rodents weren’t caught in our mousetrap, we would like to hear about them.